More than a decade since the first Meet the Future luncheon, and the awards ceremony continues to celebrate the brightest students of the Academy of Construction and Design (ACAD) — those graduating with trade skills to also prepare them for alternative life pathways. Newcomers to this event may have questions, including: Why is there a Meet the Future luncheon? How is it supporting student scholars? Here, we break down the basics of the event and highlight the latest developments with Ralph and Beth Moore, program director for the D.C. Students Construction Trades Foundation. How will this year’s Meet the Future luncheon differ from that of previous years? Moore: We’re having our first Signing Day as the focus of this year’s Meet the Future event. Employers have been engaging with ACAD students during the school year, and will interview students over the next month to make job offers that will be announced at the event. What is the purpose of the annual luncheon? Ralph: Career and technical pathways lead to hundreds of high demand, high wage jobs. Our annual scholarship and awards luncheon celebrates students who complete this academic, technical, professional skills and leadership training to achieve success anywhere on the path — from entry-level to technical and professional careers. How are students chosen for awards? 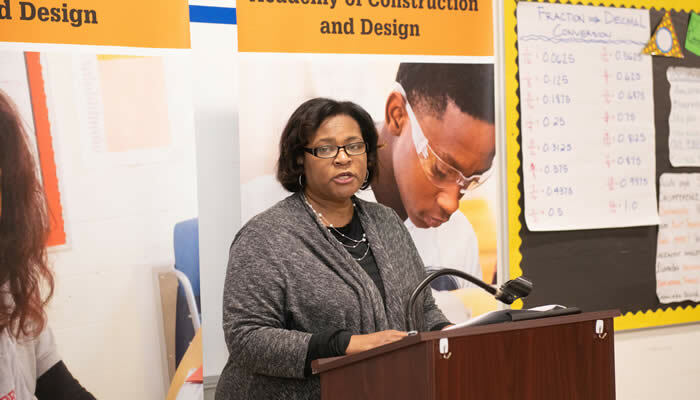 Ralph: Students in the Academy of Construction and Design are eligible for Meet the Future scholarships and awards based on their achievement in Academy programs, overall school performance and good citizenship in the school community. Why is it important to recognize students in this type of celebratory environment? Moore: For the industry and government, it’s important to continue to emphasize the value of both school to career or school to college pathways — both tracks lead to positive futures. And for our students, it’s an opportunity to show off the networking skills they have worked on and the connections made with industry leaders that can help shape their future careers in the industry. How increasingly important have the business and construction communities been in this event? Ralph: Historically, our organization was an early leader in the career academy model in D.C.’s public schools. Industry employers, who provide thousands of jobs, continue to work with us to increase opportunities for local youth. What are their roles within this program? Ralph: Our audience includes leaders of companies that are adopting new technologies and construction practices that are changing the industry. They are exceptional mentors for Academy students. What are the benefits to the participating companies? Moore: Beyond the event, our industry partners have the opportunity to shape the work we do by providing guidance on industry trends, insight into how these changes are impacting workforce needs, and direction on skills to include in our curriculum. Ultimately, how do you measure success for Meet the Future? Moore: The greatest success from my perspective is hearing the personal comments of the industry leaders that attend. Hearing their positive impressions of ACAD students is everything we work for. Find out the ACAD scholars that earned awards and job offers in the next edition of the JOBS Coalition Pathways newsletter.